What is Maui in Motion? 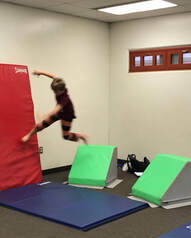 Maui in Motion is our interpretation of parkour and free running. Parkour is an activity of moving fast and efficiently through your environment; negotiating obstacles by running, jumping, and climbing. ​Free running is a version of parkour that involves acrobatic moves such as gymnastics tumbling, breakdancing/hip hop, and non-combative martial arts. Just as any class we offer, Maui In Motion classes will be led by a trained coach to provide a fun, safe and active environment to learn and develop physically in. We are offering classes for three age groups: K-2nd, 3rd-5th, and 6th-8th Grades. Please see a full list of Maui in Motion movement workshops on our class schedule.